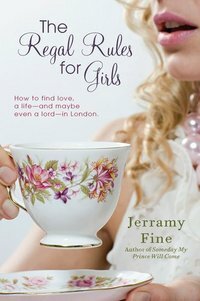 I picked up The Regal Rules for Girls: How to Find Love, a Life – and maybe even a Lord – in London by Jerramy Fine because I figured it would be a fun book, especially since as a young girl I had fantasies of being whisked off to Balmoral by the Prince of my dreams and even kept pictures of eligible royal bachelors scotch-taped to my bedroom wall: Prince Andrew and Prince Edward of the UK and Crown Prince Felipe of Spain. Yes, I always wanted to be a Princess and truth be told I still do despite the fact that I now know that the fairytale is an illusion and more bother (perhaps) than it’s worth. There’s more to being a Royal than fabulous hats, tiaras, and riding horses. The cover is cheesy to say the least but includes some amusing tips. Ms. Fine explains how to begin making your dream of meeting the royals and the aristocracy come true. Rule number 1 you need to go to the UK, specifically London, to hang where you are most likely to rub elbows with the Castle Crew. Rule number 2 one must learn their manners and the rules of etiquette. Manners is something which unfortunately gets short-shrift in the US but is absolutely essential in the UK. It goes on about what to do if one is introduced to the Queen, how to dress, how to RSVP to a wedding invitation (hand-written please), where it is appropriate to wear hats, to avoid anything other than the Royal Enclosure at Ascot, and the ins and outs of the British Season. Most importantly: Do not fake a British accent! She advises American girls who want to nab an Englishman, royal or not, that it is good to brush up on one’s history. It’s probably a good idea to know that Queen Victoria is Prince Harry’s great-great-great-grandmother if you plan on walking down the aisle at Westminster Abbey. I think that if you don’t even know this commonplace detail you are not worth your Wellies. I found myself giggling over this book and how it brought back memories of all my lovely fantasies of becoming royal. I was amused right up until she answers the question, “Why are Roman Catholics excluded from the line of succession?” I nearly lost it! This book states that this exclusion dates to the time of Henry VIII’s failed attempts to annul his marriage to Catherine of Aragon and his eventual establishment of the Church of England when the Pope would not grant what he wanted. This is not true; not by a long-shot. Henry VIII’s daughter Mary Tudor reigned after the death of her brother Edward VI and was a Catholic. She was nicknamed “Bloody Mary” for her penchant of persecuting Protestants. Catholics were not formally excluded from the succession until the passing of the Act of Settlement in 1701. Thanks, James II (look it up, it’s riveting history). Up until that time it was preferred that no Catholic ascend the throne but they were not officially excluded. She adds further insult to injury by suggesting that one read The Other Boleyn Girl by Philippa Gregory to gain more insight into Henry’s break from Rome. Really, she actually suggests that an American girl read an historical fiction that takes severe liberties with “actual” events to learn about royal history? This is ghastly advice! We, Americans already have a bad rap when it comes to historical knowledge and this recommendation of the well-meaning author is too much to be borne. Listen, young ladies, I am not professing that one stop dreaming of becoming a royal, it is fun to fantasize (I, myself, still have delusions of grandeur) but if you want to become knowledgeable about British and royal history pick up a history book. The real stuff is so much more interesting than the fiction. And even if you don’t bag a Prince you’ll be amazed at how impressed Englishmen can be when a cute American girl is informed about English history. I recommend reading a biography of Henry VIII while practicing your curtsy. Ms. Fine insists that you keep your heels, head, and standards high. I agree but those high standards should also be directed to the books you use to gain knowledge. Trust me, even if Prince Harry is not impressed by your knowledge of his family history you can bet your future father-in-law and Harry’s grandmother will be. Filed Under: For Fun, General Reading, History, Reminiscences.